Kevin (Randy Harrison), Ted (Paul Anthony Stewart) and Donna (Erin Cummings) form an odd triangle in "Harbor." Photos by Carol Rosegg. FOR some, family is more a punch in the gut then a loving tap on the shoulder. 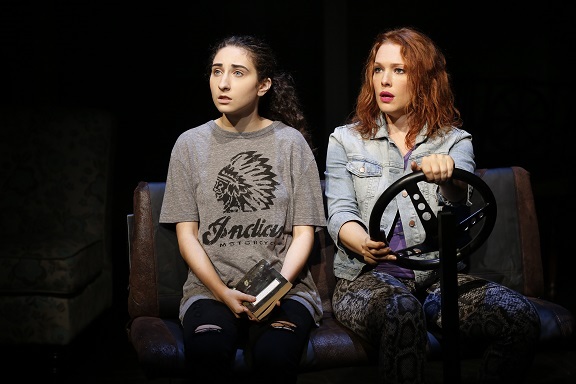 In other words, kinship can be a scary thing, as it is in Chad Beguelin’s “Harbor.” The play is in a Primary Stages production at 59E59 Theaters through 8 Sept. When she drops in on her brother Kevin (Randy Harrison), Donna Adams (Erin Cummings) disrupts the nicely ordered life he has established with his husband, Ted (Paul Anthony Stewart). Along with her teen daughter, Lottie (Alexis Molnar), Donna brings some “brick(s) of truth” – a favored expression for unwelcome tidings – into Ted and Kevin’s home. Donna is a force of destruction, shattering their Sag Harbor idyll. CB has written a heartbreakingly poignant comedy, full of mordant humor and some of those moments where reality meets consequences. He has peopled “Harbor” with characters whose flawed humanity is sketched in intimate and loving detail. “Harbor” defies pigeonholing but could be called a dramedy for simplicity’s sake. Lottie (Alexis Molnar) and Donna (Erin Cummings) are on a truth-seeking journey in "Harbor." The exceptional script is buoyed by an excellent ensemble. All four actors, under Mark Lamos’ direction, give sensational, multifaceted performances. The gorgeous set by Andrew Jackness makes a perfect backdrop for “Harbor.” The exterior of the immaculate home shows up on the wallpaper of its interiors. The design is a picture of order, onto which Donna can work her powers of disarray, and Lottie can get a sense of stillness and peace.